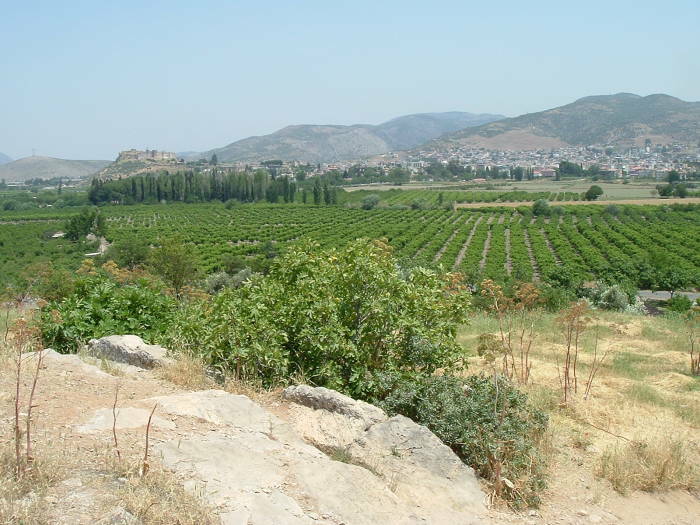 We're going to walk from the town of Selçuk to the ancient city of Ephesus. 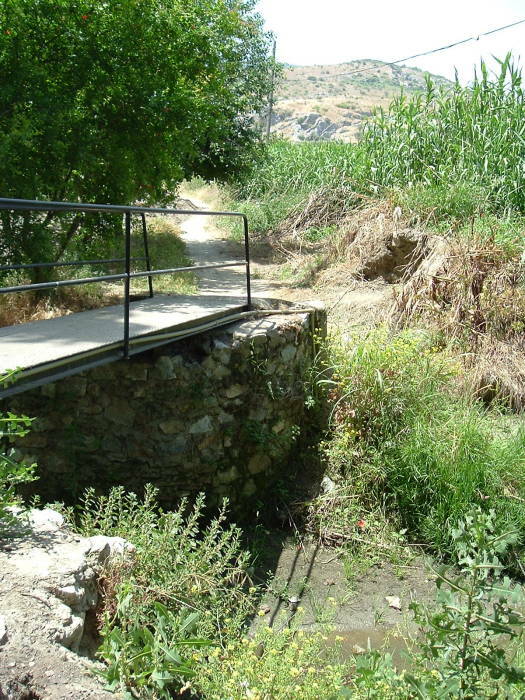 This is a pleasant stroll of maybe two kilometers with plenty to see along the way. Here's the view from the rooftop terrace of a guesthouse. 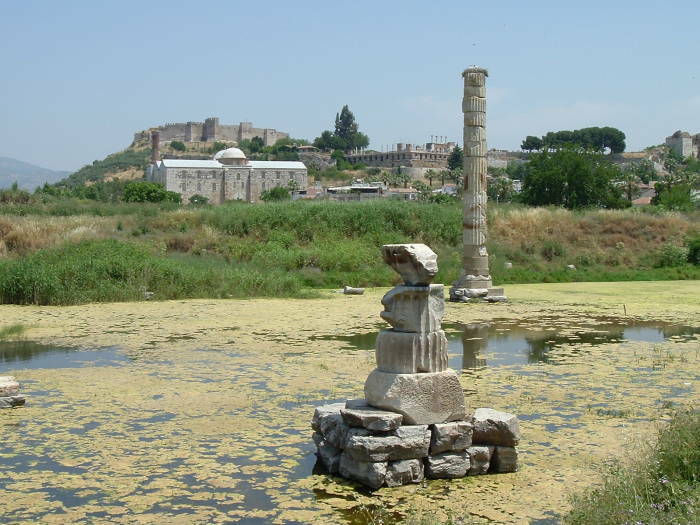 The Temple of Artemis, one of the Seven Wonders of the Ancient World, is visible a short distance away. See the column in front of the clump of trees? That's the first destination. The Aegean coast is off in the distance, maybe 10-12 km straight away. 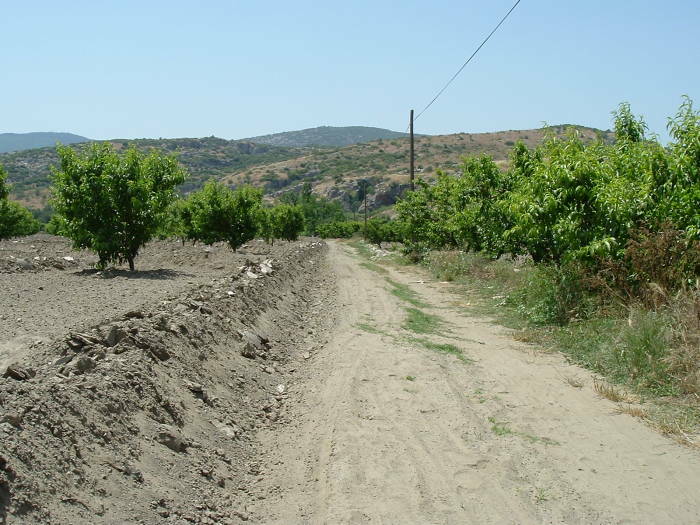 Walk down to the highway leading out of Selçuk to the west, toward the coast and Kuşadası. Walk along its broad shaded sidewalk, past the jandarma (national police) station, to the gate into the Temple of Artemis. This is it, all that remains of the 2500-year-old Ancient Wonder! Well, there's more than the one reconstructed column and the other column fragments — if you visit in dry weather (try late summer and fall), you can see portions of the original temple floor. The site of the Basilica of Saint John is just to the left of the column. Further to the left is the Isa Bey Mosque, and beyond that, the hilltop Byzantine-era citadel. 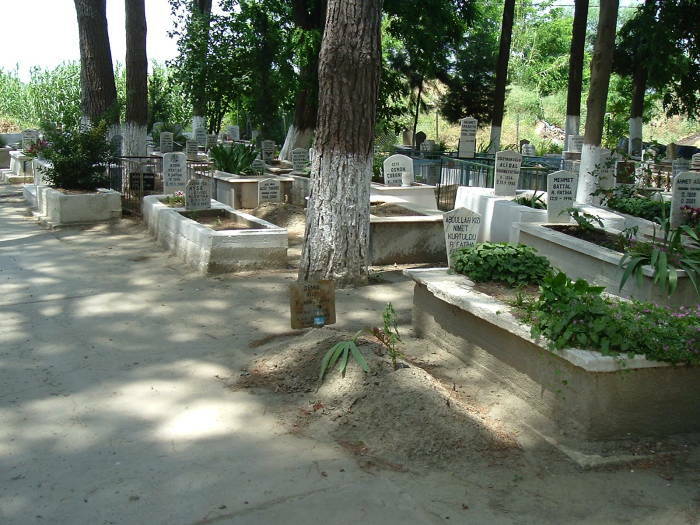 When you have finished your visit, carefully cross the highway to the cemetery. There is a nice monument to Turkey's military dead at the entrance. The cemetery itself is quiet and cool under the shady trees. Near the front of the cemetery, along its right-hand side as seen from the road, you will find a path that crosses a small bridge and leads to a path between local farm fields. Here's what you're looking for! Cross the bridge and follow the path. Follow this path between a variety of farm fields. 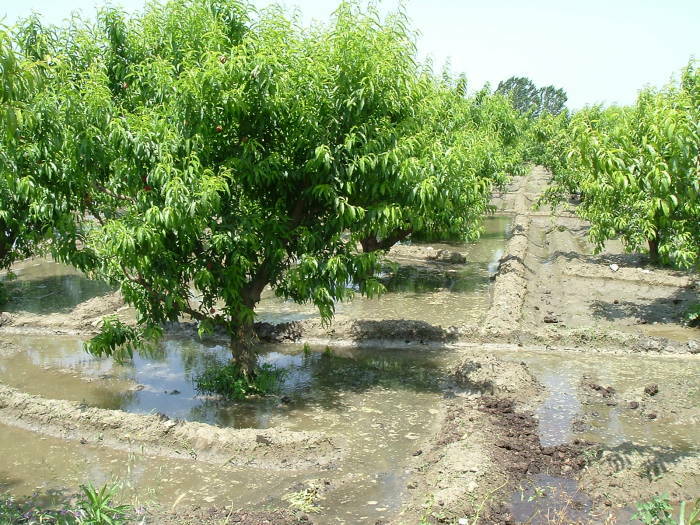 You will see an orchard to your right, and a mixture of fields to your left. In some seasons you may see pamuk, or cotton, growing or being harvested. You have probably heard of the site of Pamukkale — its name literally means "Cotton-Castle" to describe its appearance. Continue along the path until it reaches a small road. Turn to your right and walk about 100 meters down the road — watch out for traffic! The road goes around a hill, there is a steep bank on its left-hand side. Watch for an area with several niches carved into a rock face. Long before the Greeks arrived, the local people venerated a Mother Goddess figure common to many west Asian and central Asian traditions. See Joseph Campbell's The Masks of God series of books for details, especially the Primitive Religions and Occidental Religions volumes. This is really the Old-Time Religion! 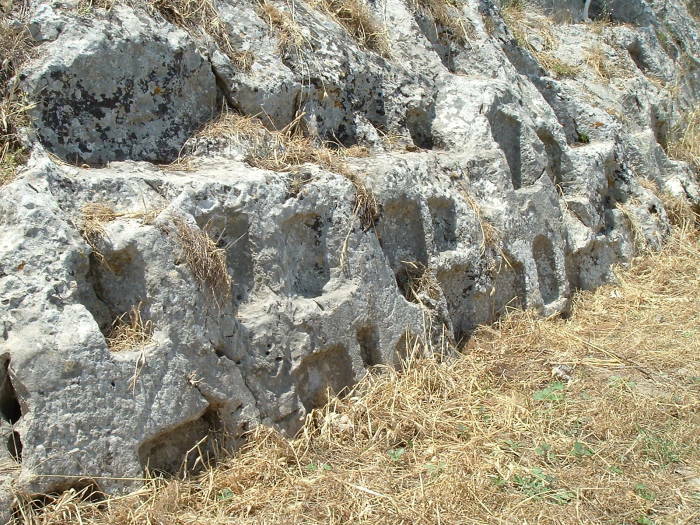 The Phrygians worshipped a version they called Cybele. 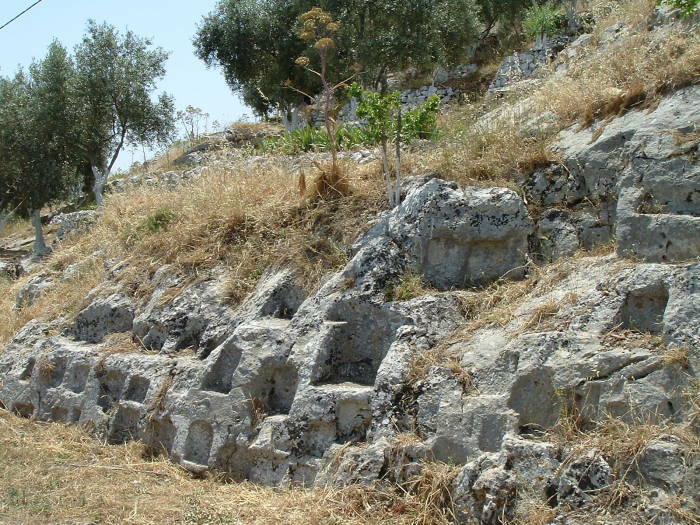 Some aspects of Cybele go back at least to the Neolithic era (about 8500-3500 BC). A figure of Cybele was found at Çatalhöyük, dating back to around 6000 BC. It depicts a corpulent and fertile Mother Goddess seated on a throne and giving birth. Mother Goddess concepts and artwork go even further back. The Venus of Willendorf statuette, discovered in Austria in 1908, was carved around 24,000-22,000 BC. Ephesus had been a major center for worship of an Asian mother-goddess figure for ages. When the Greeks arrived they labeled this goddess as their Artemis, although the Asian goddess was really nothing at all like the Greek huntress goddess Artemis. The Temple of Artemis was said to contain a squat statue of the mother-goddess, carved from a meteorite. Even in the 400s AD there was still quite a bit of the "old-time religion" in the area. Many scholars believe that this ancient tradition influenced the early years of Christianity. Some of the Roman Catholic titles for Mary such as "Queen of Heaven" and "Star of the Sea" come from earlier Near Eastern traditions. The increased Christian emphasis on Mary really began at the Third Ecumenical Council in 431, which formally gave her the title "Mother of God". Some feel that this may have been done to make Christianity more attractive to local people — include the comfortably familiar major mother figure. For details, see Australian historian John Romer's Testament book and associated television series. Joseph Campbell's The Masks of God: Occidental Religions also discusses this. Reverse your direction along the road, walk back past the farm path and about another 500-600 meters to the Cave of the Seven Sleepers. Visit it, then continue in the same direction to the upper entrance to Ephesus. Here's a view looking back at what you've done so far. 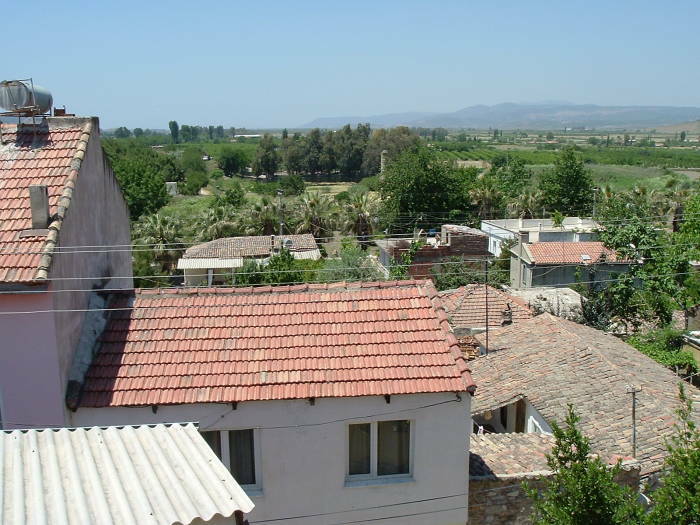 The Byzantine fortress is visible toward the left, just over a kilometer away. The central part of Selçuk isn't really visible from here, but you do see the eastern parts of the town where it spreads up the hills. You came through the cemetery, which is just below the fortress (and which hides the Temple of Artemis). The path came through those fields, joining the road (barely visible just down the hill from this viewpoint) somewhere out of the frame to the left. A few righteous youths (the mystical seven in many cases) are living in difficult times. They are chased out of the city by an angry mob offended by their beliefs, and they hide in a cave. There is a cave-in, they're trapped, and eventually they fall asleep. They wake up, and realize that their clothes have largely rotted away. In some versions, a dog that was with them is now nothing but a skeleton. They leave the cave, and eventually realize that many years have passed. Now their faith has become the dominant one. The cave — actually the ruins of a church complex built over the sites — is a popular pilgrimage site for Muslim Turks, who venerate these faithful believers in the One True God. 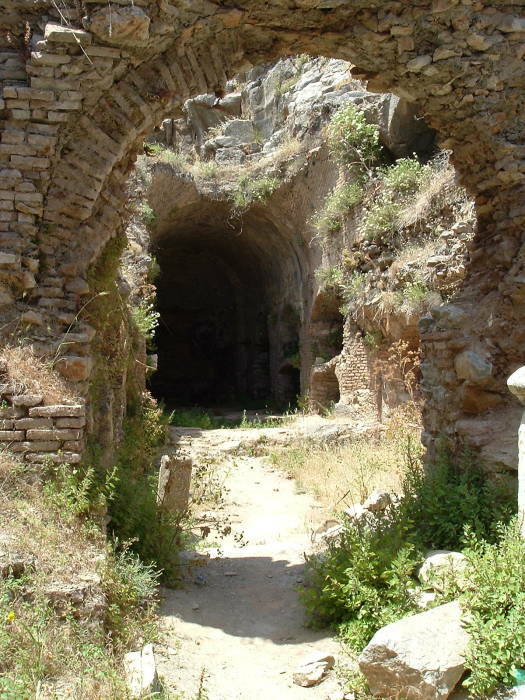 There is a parallel Islamic story of another cave, said in Turkey to be near Sardis. In this one the youths emerged from the cave to find the newly common Christians venerating icons. They went back into the cave and fell asleep again. When they woke up the second time, it was after the arrival of Islam. See Surah 18, verses 9-26 for the story from the Qur'an. 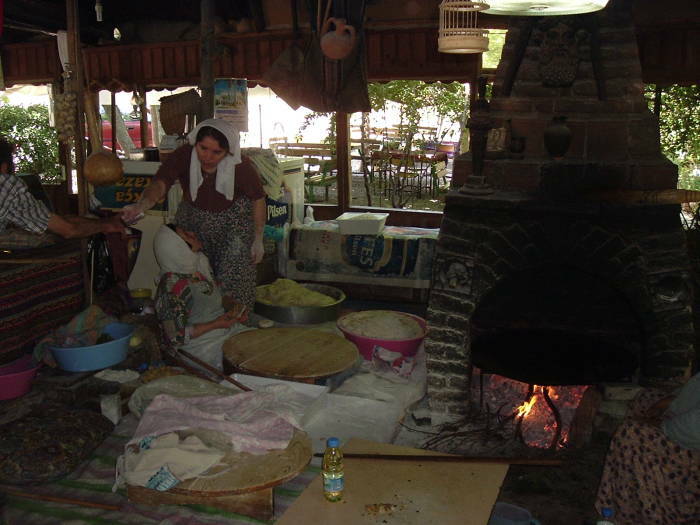 Make sure to stop for some freshly prepared gözleme in the tea house at the Cave of the Seven Sleepers! 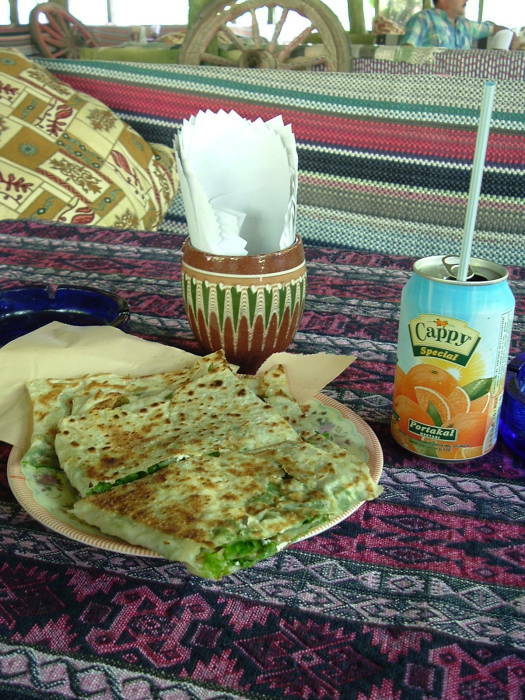 Gözleme is similar to what the French call crepes, with fillings including cheese and spinach. Now you're ready to tackle Ephesus!